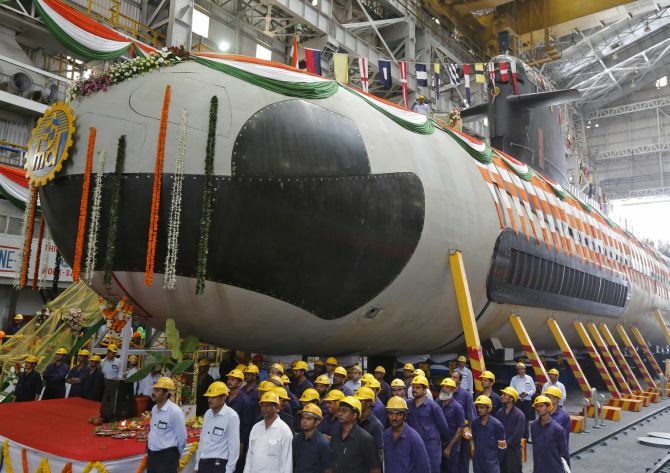 Australia's The Australian newspaper on Thursday uploaded a fresh tranche of leaked documents relating to information about operating instructions of underwater warfare system of the six Scorpene submarines which are being built in India by French firm DCNS. However, a top defence analyst allayed fears that it could compromise the security of the strategically important combat vessels. Like in the previous case, the newspaper has blacked out all details which it felt would compromise India's security interests. However, the new set of documents, with Indian Navy insignia on it and marked "Restricted Scorpene India", gives details about the sonar system of the submarines which is used to gather intelligence underwater. It talks about a wide range of technical specifications of the sonars and at what degree and frequency it will function. The documents detail the "Operating Instruction Manual", which talks about how to select a target for weapon firing, weapon configuration selection, among others. Though the Navy has not yet officially reacted to the release of new documents, sources maintained that it does not compromise national security. They said the same information about a submarine was on "many naval defence websites". "On the face of it, these documents are basic operating manual. You buy any goods from the market, it will come with an operating manual," defence analyst Commodore Uday Bhaskar (Retd), Director of Society of Policy Studies told PTI. If the question is if tonight's revelation has made our submarines vulnerable, "then the answer is no", he said. "It is more like basic operating instructions for the user," he said. The paper said it has been told that the secret data was removed from DCNS by a former sub-contractor in 2011 and taken to a private company in Southeast Asia before being passed on to a branch of that company in a second Southeast Asian nation. A disk containing the data filed was then posted in regular mail to a company in Australia. DCNS is focusing its investigation on former employees and sub-contractors involved in the project. At this stage it is not thought that the leak came from India.